In WW2 Captain Ford and the crew of the Pan Am California Clipper were faced with an unprecedented challenge: simply getting home. Note: If you’ve not read the first part of this story, you’ll want to start here. The British, Ford decided, were a strange race. On the one hand, they had welcomed his crew to Triconmalee, a little, battered, corner of their Empire with open arms (luckily the Dutch, unlike the Aussies, had managed to phone ahead). On the other, they simply refused to believe that a civilian aeroplane could properly identify a submarine. It didn’t matter that the California Clipper had flown right over the damn thing. Hell, Ford thought, it didn’t matter that it had taken a shot at them. As far as the British were concerned, unless one of their own pilots had seen it, it didn’t exist. This particular element of Imperialist pigheadedness aside, however, Ford had to admit that they had been more than accommodating. His crew had been fed and billeted, and the California Clipper refueled. In fact practically the only person who hadn’t rested was Ford himself. The British had insisted that Ford simply had to attend a dinner party that night. They wouldn’t tell him who was hosting. They just politely insisted that their commander was hugely impressed with both Ford and his crew’s achievements so far and that he really should attend. The British, Ford mused as they waited in the drawing room of the commander’s residence, seem to do everything politely. They probably even apologised during invasions. Maybe that was how they’d got away with doing so many of them. Ford was broken from his daydreaming by Rod Brown, standing next to him in the cleanest uniform he’d been able to muster. Rod was there because Ford had decided that if he was going to have to go to a dinner party he was damn well not doing it alone. Sometimes rank had its advantages. “I think our host is coming” Rod muttered. She was indeed, sweeping into the room just as Rod finished speaking. Before Ford and Brown could muster more than a basic greeting their host launched into an apology. She was Lady Caldecott, she explained, wife of the Governor of Ceylon, Sir Andrew Caldecott. The Governor had been fascinated by the California Clipper’s quest and had been desperate to meet the men involved. Unfortunately duty had called him away. To Ford’s relief, although he tried to disguise it, the dinner party would be a far more low key affair than originally planned. Lady Caldecott did have one request though— the Governor wasn’t the only one who had been fascinated by their journey, their teenage son had too. Would Ford and Brown perhaps spend a few minutes talking to him about it? This was something Ford was more than happy to do. Ford and Brown spent an hour regaling the boy with stories of their adventures so far. As Bob Ford pushed the throttles to maximum for takeoff the engines briefly stuttered, and Swede winced slightly. The good news was that the British had been able to top up their dwindling supply of 100 octane. The bad news was there was still some regular 90 octane in the tanks. To begin with, takeoff went as planned. Soon, however, the banging started again. Swede had hoped that the enrichment from the newly-loaded 100 octane would counteract the poor qualities of the 90 but it seemed they’d still have to do some careful balancing. “We’ll probably have to put up with that until the fuel flow purges all of that 90 out of our system.” Swede shouted forward to Ford and Mack in the cockpit. “Okay Swede.” Ford acknowledged, swinging the plane towards Karachi. Half an hour later they were on course and the banging seemed to have subsided. Ford was just about to switch out of the pilots chair when suddenly a huge explosion rocked the plane, which lurched hard to the left and threw Ford clear out of his seat. “What the hell? !” Shouted Johnny Mack, fighting to right the plane on his own. “Number three has lost oil pressure!” Shouted Swede from his station. Mack lunged for the controls to shut it down. John Parrish rushed to the rear and climbed the ladder to the observation dome through which Rod Brown had been taking astral measurements a few nights before. It didn’t take long to work out that engine three was gone. Blown by the bad fuel mixture and now streaming oil. Thanking their lucky stars that they were only half an hour out from Trincomalee, the crew of the California Clipper turned their wounded plane around and limped back to Ceylon. Jack Poindexter smiled and laughed with the rest of the crew as the men of the RAF sang songs and raised toasts to absent friends and family. With the help of the RAF at Trincomalee, the crew had managed to strip down and repair the California Clipper’s broken engine in near-record time. They were now ready to resume their flight in the morning, and in the meantime the RAF had insisted that the crew of the seaplane would celebrate Christmas with them — together they would all raise toasts to their families far, far away. As the night grew darker, however, and the songs sadder and more wistful, Jack couldn’t help but admit he was taking it harder than most. All he could think of was his wife and family back home. Whilst the rest of the crew had at least had time to prepare for an extended absence from their families — albeit not one quite this long — Poindexter had not had that luxury. Here he was, on the wrong side of the world, armed only with a couple of spare shirts and the memory of apologising to his wife for the fact that he was going to be late home for dinner. Worse, wartime secrecy meant that he had not been able to talk to her since. Pan American had at least made sure that she knew he was still alive, but as far as she, or indeed as far as any of their families knew, they were still trapped in Auckland. That night, as he spent Christmas Day in an RAF mess hall in Ceylon, Poindexter swore that one way or another he would make it home to her. After the drama of the last week, the flight to Karachi had been relatively easy. ‘Relatively’, of course, was the key word. Before Australia, the thought of flying for nine hours over land would have filled the entire crew with dread. By the time they had to do it in India, however, it seemed almost routine. The landing at Karachi went smoothly and soon the crew were taking advantage of their presence in a major city. Not least by finally each enjoying a decent bath. All of the crew reported to the California Clipper the next day feeling relatively refreshed. It soon became clear, however, that plane herself was beginning to show her own signs of strain. The Captain looked up at his command. The California had done well to get them this far, but there was still an awfully long way to go. She needed rest and repair as much as they did. She would get it today, Ford decided. Swede’s news didn’t entirely surprise Ford. The flight to Bahrain had been straightforward, but on arrival it had been immediately clear that the British airfield in Bahrain was nowhere near as well stocked as those in India. As always, there seemed to be plenty of 90 octane available, but after practically losing an engine to inferior fuel at Trincomalee Swede, Ford’s Chief Engineer, made it clear he was not overly keen to repeat the experience. The next morning the California Clipper was once again airborne. But this time on a mix of 100 and 90 octane fuel. Fourth Officer John Steers stood at the front of the boat as they carefully surveyed this particular stretch of the river Nile. They’d landed at the RAF facility here the day before and, once again the RAF had fallen over themselves to be helpful. Not only had they confirmed that they could supply the California Clipper with the 100 octane they so desperately needed, but they had also confirmed that they had maps and charts as far west as Leopoldville. Rod Brown had been delighted — the makeshift mix of atlases and charts he’d used since Auckland was no longer needed, for this part of the journey at least. If they could reach Leopoldville then the crew knew that they’d at least be back within company territory. They now knew for certain that the Congo Pan Am base Ford had heard talked about existed, but it was both small and very new — one that had barely been established by the outbreak of war. It was company territory nonetheless, and that meant fuel was guaranteed and — just as crucially — it would have all the route maps they could wish for. To get there though meant getting out of Khartoum and that was easier said than done. Landing had been relatively easy —or at least as easy as landing a flying boat, without any charts, on the river Nile could be. Leopoldville was 1,800 miles from Khartoum, however, and that meant taking on a fair bit of fuel. Now masters of the unplanned landing and departure, Ford and his crew had quickly spotted that the additional weight required pushed the California Clipper’s takeoff distance beyond the length of the channel marked out in the Nile as cleared for seaplanes. That was why they’d sent Steers out in a boat with a couple of willing RAF men — to find a long enough stretch of river from which the flying boat could launch. By the afternoon Steers had done exactly that. He’d found a channel about three miles long that was free of all possible obstructions. He returned to Ford and shared the good news. 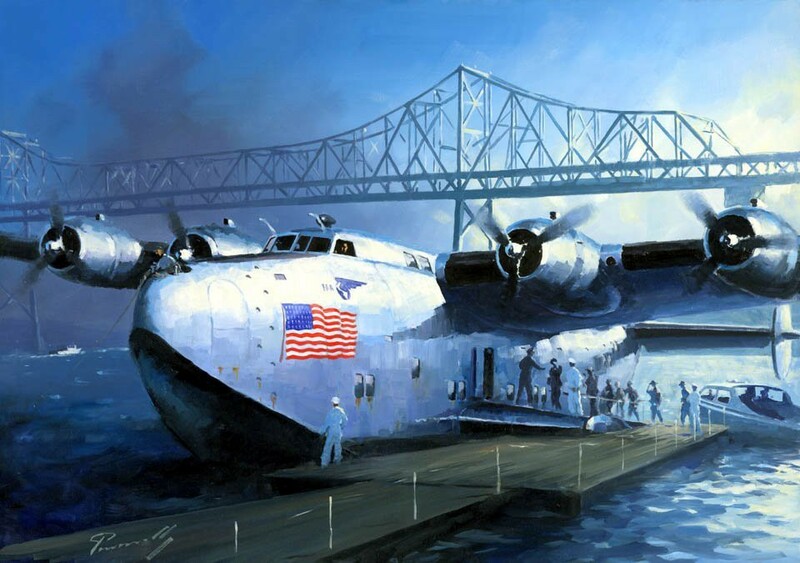 The next morning, New Year’s Day 1942, saw the California Clipper racing down the Nile with a full load of fuel. It was a textbook takeoff. Ford eased her up off the river, rocking her back and forth until she finally broke free from the waves. As they began to climb though, a loud hammering noise began to pound through the cabin. Once again John Parrish was sent back to the navigator’s dome to check. He was soon back up front with a report. Ford thought through the options. They had no spares left on the plane, and there wouldn’t be any back in Khartoum. To him, that meant there was only one choice. Ford considered his Chief Engineer’s words carefully. They’d landed at Pan Am’s nascent base at Leopoldville the day before. Like Khartoum it meant landing on a river — the Congo, but this had gone fine. They’d also been able to refuel with 100 octane. The problem, however, was the distance the California Clipper would have to cover if it was to complete the next leg of its flight. Natal, in Brazil, was the nearest practical point of landing on the other side of the Atlantic, but it was 3,480 miles away and there were no possible stopping points in between — just an awful lot of ocean. The maximum posted range of a Boeing 314 was about 3,600 miles. Once factors such as wind, weather and navigation issues were taken into consideration, that left them frighteningly short of leeway. And therein lay the problem. One way to mitigate the risk of falling short and ending up in the sea was to overload on fuel, of course. If they did, they would stand a good chance of making it. But that also brought it’s own risk — whether they’d be able to get airborne at all. “It’s possible to load as much as 5,100 gallons of fuel onboard.” Explained Swede, running through the numbers. “But that would put us 2,000 pounds over gross weight. Ford thought carefully for a while. Finally he made a decision. When they had landed the day before, both Ford and Mack had noted the strong current in play in the Congo river — at least six knots by their estimation. Now, taking Swede’s reservations on board, they decided to try and use that current to their advantage. Mack taxied the California Clipper upstream and they prepared to make a take-off run. It was now or never. Ford threw the throttles forward to full power and the flying boat’s engines roared into life, sending California racing down the Congo in the 100 degree heat. Ahead of them, in the distance, both Ford and Mack could just make out the start of the Congo gorges — a network of cataracts, waterfalls and rapids running through a maze of canyons at the end of the river. The guidelines for the Boeing 314 stipulated that the absolute maximum time it could spend at full power for takeoff was 90 seconds. Without thinking about it, Ford, Mack and Swede all began mentally counting up towards this total. 20… 30… 40… The California Clipper raced down the Congo but refused to break free of the water. The broken exhaust hammered and howled, the rapids drew nearer and nearer, and the engine gauges pushed further and further into the red. The overloaded seaplane still refused to break free from the water. 50… 60…70… All eyes on the flight deck were fixed on the gorges ahead now. They were barely 1,500 yards away. The airspeed indicator crept over 70 knots and Ford rocked the flying boat, desperately trying to break her free from the river as he’d done in Khartoum. “Ninety one seconds!” Swede suddenly shouted, his eyes locked on the engine gauges, their needles pinned in the red. “Keep those throttles open!” Ford shouted back. Ford refused to answer. Just as the flying boat seemed about to hit the gorges he gave one final, desperate, heave on the yoke and she finally broke a few inches free from the water. The California Clipper flew forward over the rim of the gorge. Without the benefit of the ground effect that had allowed her to break free of the surface, she immediately plunged down into the rocky defile below, curving out just above the water once again. The plane was now racing along just a few feet above the water through the narrow rock walls of the Congo valley. With her engines still red-lining, the California Clipper screamed in agony. 100… 110… 120.. 130… every second at full power was an extra inch of height, but it was also a step closer to critical failure. “Rate of climb ten feet a minute!” Mack shouted over the sound of the aircraft’s distress, his eyes locked on the dials in front of him. Ford’s eyes had remained firmly focused forward and he’d spotted that the canyon they were flying down was about to make a shallow turn. They wouldn’t clear it before they got there. Ford nodded and waited for the point at which he’d need to begin a gradual turn. Then, to his horror, he discovered that the controls wouldn’t respond. Quick as a flash, the engineer suddenly realised what was happening. Without thinking, Ford lunged for the rudder pedals. He would later say it was pure instinct. Whatever it was, it almost certainly saved both plane and crew because it worked. It slewed the aircraft round just enough and she cleared the canyon wall by a whisper. 140… 150… 160… 170… California had now been at full power for twice as long as the Boeing 314 was rated for. Every second seemed like an eternity to her crew. She howled and shuddered, as if trying to pull herself apart. Every twist in the canyon also forced Ford or Mack to pull the aerial equivalent of a hand break turn, pounding the pedals in order to avoid a crash. Then, finally, as if she were determined to make one last lunge for freedom, the California Clipper ripped free of the canyon and climbed slowly into the sky. “Shut her down!” Yelled Ford. Swede Roche lunged for the engine controls, bringing the aircraft back down to normal cruise climb. He looked at his watch — rated for no more than 90 seconds at full power, she’d been at it for more than three minutes. Swede couldn’t resist it, he leant down and stroked the deck. 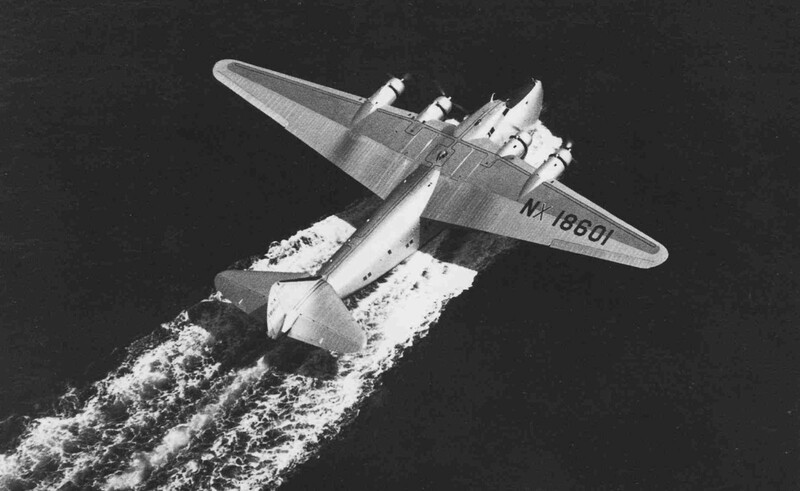 In the cockpit, for the final time, Bob Ford and Johnny Mack turned the California Clipper to the west. If they survived this leg, then they knew they were as good as home. If. “Let’s not do that again.” Said Mack, beads of sweat running down his face. It was Jim Hendricksen and John Steers who were in the pilot seats when they finally sighted the coast of Brazil. It was 9am and they’d been airborne for about 20 hours. As the others raced up to the flight deck Steers reached for the charts they’d taken from Leopoldville. Brown, arriving in the cockpit, took the map from him and measured the distance to Natal. Ford and Mack appeared from below where they’d been eating breakfast. The others filled them in as they took over the controls. Three hours later the California Clipper landed in Natal. She had been in the air for 23 hours and 35 minutes. It was a new world record for a Boeing 314. As the crew disembarked at Natal the Pan American station manager handed them all a beer. Bob Ford swigged his down in one single gulp. “Best damn beer I ever had.” He remarked with satisfaction. Johnny Mack laughed, and did the same. After Natal, the last two legs of the flight home passed quickly. The crew were on Pan Am territory now, far from the chaos of war. The departure from Natal had been uneventful, although their jury-rigged attempt at a new exhaust cowl for engine one had blown off on take-off. Not that it really mattered, Ford thought. They had filled California with fuel she couldn’t stand, run her hotter than she was rated and flown her farther than any Boeing had ever been without maintenance before. She hadn’t let them down. She was a tough old bird, and he couldn’t help but be proud of her. As they finally approached the east coast of the US, Ford looked around the cabin — at Mack, Swede, Poindexter, Brown and the rest — and in that moment realised what they’d all done. He could see from their faces that all any of them cared about now was finally getting home to their families. In a few days though, he suspected (and hoped), that for each of them it would finally sink in. By flying from San Francisco to Auckland, and then from Auckland to New York, the California Clipper and her crew had become the first commercial plane to circumnavigate the world. With America now at war, Ford realised, it was entirely possible that few people would ever hear about that. The California Clipper was a precious military asset now, her location and actions fiercely guarded secrets. Her crew would know though, and that was all that mattered. California’s Captain turned to Poindexter, who Ford had figured damn well deserved to have the radio desk for the final approach. Poindexter beamed and gave Ford the thumbs up. The channel was open and Ford began to speak. LAGUARDIA TOWER LAGUARDIA TOWER. OVER. And then, for the first time in the entire journey, Captain Robert Ford of the California Clipper found himself lost for words. “Skipper?” Prompted Johnny Mack, quietly. Then it came to him, and Ford smiled. And somewhere, out there in the distance, a coffee mug shattered. Hard as it may be to believe, everything you have read in this series of articles is true. The library, the fuel problems, the submarine, the exploding engine, the incredible takeoff from the Congo river — all of it. Ford was right to suspect that the incredible achievement of the California Clipper would largely go unnoticed. In peacetime it would have been front-page news across the country — not least because Trippe, ever the publicist, would have wanted to take full advantage of the opportunity to have Pan American front and centre in the news. But America had just been jolted into war. It was focused on military heroes now, not civilian ones. Over the next few years Ford and his crew would be split up, doing their own bit for their country in various flying roles. Pan American would commemorate their achievement by renaming the California Clipper to the Pacific Clipper, but even that clue to its remarkable achievement was short-lived. The aircraft was retired in 1946, when the golden age of the Clipper came to an end. Ford and the majority of the California’s crew survived much longer, but they rarely spoke about what they had achieved. Indeed in the few public (or semi-public) interviews I have been able to track down, it is hard to shake the suspicion that they didn’t like the attention. As I have found with other aircrews of the era, they seemed fully aware of what they had done, but disbelieving of the idea that any of their peers would have done anything different. I disagree. They were normal men, true, but what they achieved was far from normal. Whatever the reason — be it the legacy of wartime secrecy or their own modesty — today the story of the California and her crew is almost entirely forgotten. Indeed I only became aware of their existence due to a chance encounter with an RAF veteran who told me what I thought was a tall tale, but turned out to be entirely true. I like to think that Bob Ford would have approved. Ford himself died in 1994 at the age of 88. It is one of the great regrets of my life that I am too young to have had a chance to meet him, and to have shaken his hand. As a result of this, in terms of sources, I’m hugely indebted to Ed Dover. His book The Long Way Home is — and whatever my own research, will always remain — the most definitive account of the California Clipper’s journey. If you have enjoyed this story then please, before you even consider donating to me, consider buying Ed’s book. Ed was lucky enough to spend a fair bit of time with Bob Ford himself and from these conversations, and his own experience with flying boats, Ed was able to piece together the conversations Ford remembered taking place at the time. The accuracy of these has generally been supported by my own research. For this reason, I have used Ed’s dialogue within this series, rather than creating my own. For other sources, I have scraped together articles from a disparate range of newspapers, newsletters and magazines — both contemporary and later. Occasionally accounts or timings have conflicted. Where they have done so, I have used my best judgement. My thanks also to the many flickrists and archivists whose images are scattered through this work, and who were either kind enough to make their work available under Creative Commons licence or to provide explicit permission, with no request for a fee, when asked. In particular, the works of Greg Bishop and James Vaughn stand out. Both of their flickr accounts provide a wonderful look back into an aviation era now largely forgotten and are well worth an hour or two of your time. Finally, a request. If you have enjoyed this series then please, please, spread the word. Share it by email, Twitter, Facebook, put extracts on your blog, mention it on podcasts or scrawl it on the back of the toilet door in the pub. The California Clipper and her crew did something utterly remarkable and unique in the history of aviation. And they deserve to be toasted, talked about and — above all else — remembered. Like what I write? Then help me do more of it. Back both me and London Reconnections, my transport site on Patreon. Every penny helps tell a story. Writer and historian (military & transport). Editor of London Reconnections and Lapsed Historian. I focus on ordinary people who did extraordinary things. Because history is fun. Honest.